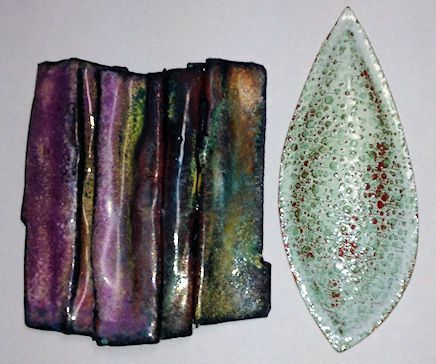 I got together with friends to play with enamels. 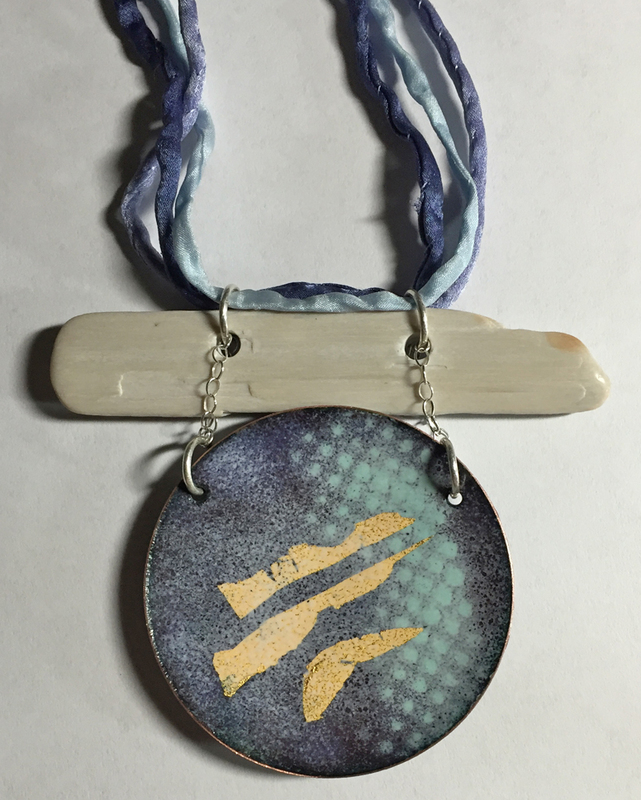 Made the round copper enameled piece, used a stencil to make the design and some gold leaf. Put it together with a long rock I drilled holes into. I used the same design and colors as on my previous piece. This time I used a layer of silver foil between the copper and enamels to see if I could avoid the oxidation from the copper. This part did work but I overheated the wires and some sunk into the enamel too much. I have to watch this firing a lot closer so I don’t over fire. There’s lots of trial and error learning the ins and outs of enamels. I still have much to learn. I decided to try another cloisonne enamel piece. I’m using copper as the base and on this piece I didn’t use any transparents so I omitted the step where some fine silver foil is added to cover the copper. Thought why waste it when it’s not going to show. Well, while making the piece, I realized there is a good reason to use it. I got oxidation from the copper coming up to the top. That happens because the copper was fired too long or too high. It’s hard to see in the picture but around the silver wires it shows up the most. Using the silver foil layer helps to keep the oxides from coming to the top. Silver doesn’t created oxides. Or I could be more careful and use low or medium melt enamel colors which is more difficult to figure out. I’m going to make another piece similar to this design with the silver foil and see how that goes. This was a good learning experience. 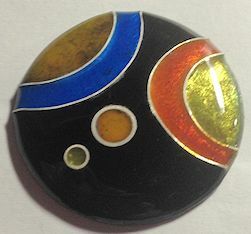 First Cloisonne Enamel Pendant – Done!! This is my first ever cloisonne piece I made. I showed it in a previous post without it’s setting. I finally had time to get the sterling silver part soldered together. The enamel piece isn’t perfect and I now know how important it is to make sure the sides are smooth and the whole piece is the same level. Where the wires are I needed to smooth that area out more so the bezel would not have a bump there. I also need to make sure my enamels aren’t contaminated. Lessons learned. The bottom stone is a titanium drusy. 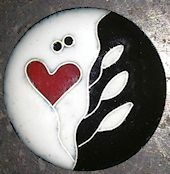 on April 27, 2014 at 10:32 pm Comments Off on First Cloisonne Enamel Pendant – Done!! Well, kinda. It’s not done. I just got the cloisonne piece done. Still have to make it into a piece of jewelry. I stayed with easy for my first piece and even then some of my wires moved. This is 1.5 inches. I put silver under the transparent curves and cells but it doesn’t show up that well. I didn’t do any shading, just plain enamels. I wanted to learn the process. Now I can get more intricate and take my time making a piece. I’m still going to turn this into a piece of jewelry just because it’s my first piece. 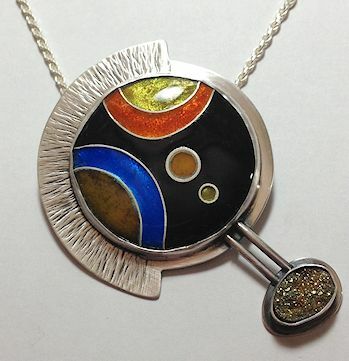 I wanted to try to set an enameled piece in a bezel setting so this piece was all an experiment. 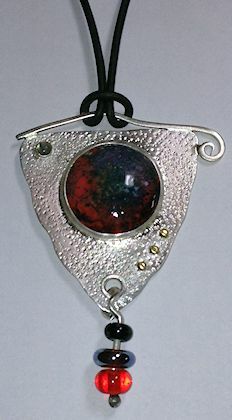 Not crazy about this piece but I did achieve what I was trying to do and that was set the enameled circle in a bezel. That part went smoothly, no cracking the of any enamel. I added a few embellishments, like the brass rivets on the side and the little cab at the top. I was planning on using fibers for the dangle, hence the reason for the larger hole but I didn’t like the way it looked. 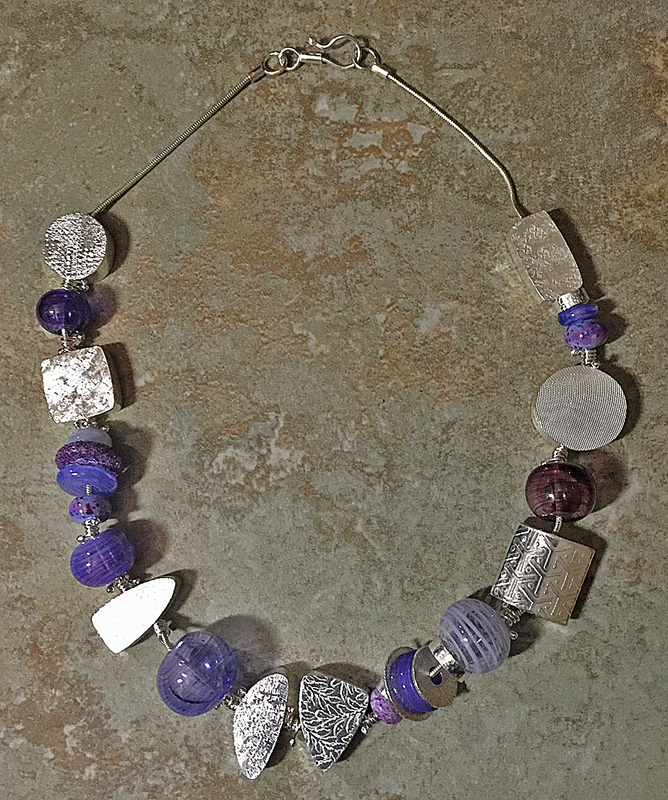 The bead dangle is a tad better. I didn’t get a chance to make a lot of beads this weekend. My cat had dental surgery this weekend and needed extra care. I was able to get together with my play day group and we played with enamels. Here’s the stuff I made. These are domed copper discs. 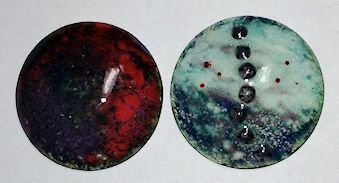 The one on the left had some interesting texture in it before I put a layer of clear enamel on. I should have left the clear enamel off. Lesson learned. The right one, has little beads that I stuck on I used some pigment enamels to add some red dots. Probably could have added more. The left piece was totally different until I put some colored enamel on it. I have no idea what I’m going to do with it yet. It’s a form folded piece I made eons ago and I have no idea how I’m going to set it in something to make it into a piece of jewelry. Maybe in another eon, I’ll come up with an idea. It doesn’t sit flat so that’s an issue right there. 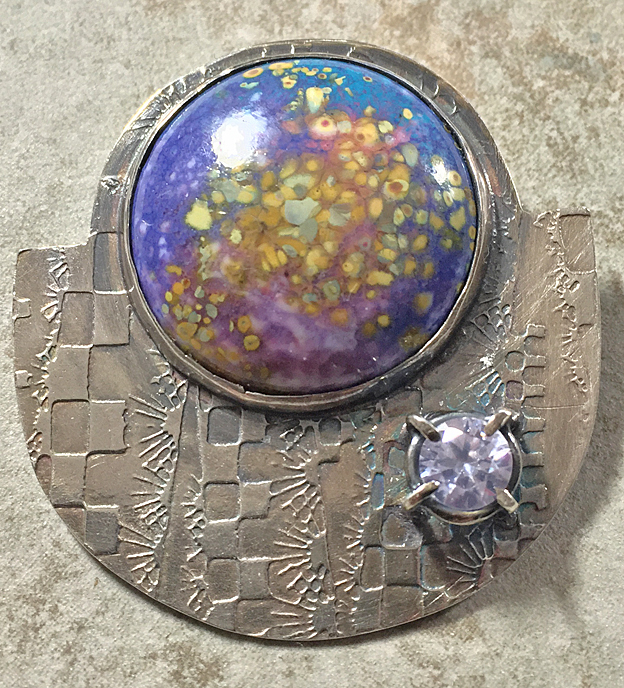 The piece on the right I domed with a die on a pneumatic press on textured copper. There is only a coat of white enamel on the top so the colors from the copper came through. I like the way this looks so I’m not experimenting on it. I’ll probably set this one first since it’s the easiest. I’m back to making beads for bracelets. 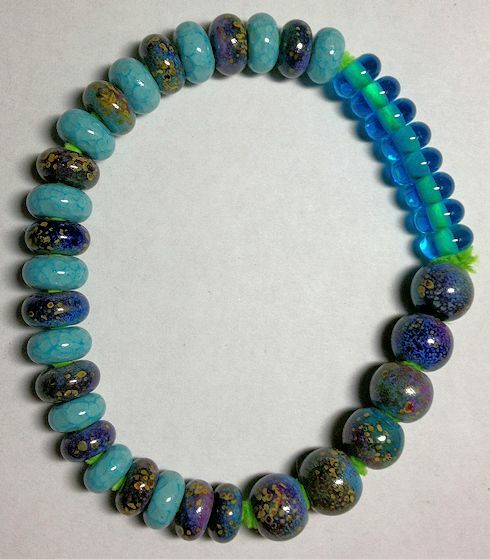 On these I used enamels and frit on all of them except the transparent aqua beads. They are kind of fun to make. I never know what color I’m going to get. I might be using some copper viking knit to go with these for bracelets.